A handy cheatsheet for helping your kids crack codes. I love this! I built this and extensively field-tested it with my own crack team of super spies (my kids). 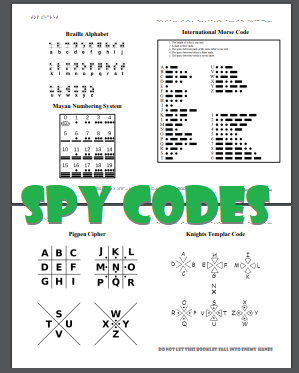 It's 6 pages of my favorite Spy Codes, for use with your own budding spy team (i.e. your kids). It is vital that your child does not let this book fall into enemy hands. Using these sheets to encrypt and decrypt messages is a practical introduction to substitution ciphers. If your kids (or students) enjoy these, there are many, many more advanced concepts that pick up where these exercises end. Last year I blogged about: Dadding 101: Give Your Kids A Trail of Codes To Break.... and of course coding trails are not limited to use by dads. Mums, grandparents, foster parents, step parents, guardians, siblings, cousins, friends... everyone should be giving trails of codes to break to all of their loved ones at all times. It's one of the most joyful things in life. I know my brother and I set these up for each other when we were not the grizzled old men we have transformed into today. Simon Singh's delightful volume "The Code Book" is a great read on the topic of codes throughout history. It's a pleasurable read and goes qute in-depth. Fun for all ages. Znl nyy lbhe pbqrf or nf rnfl nf guvf bar!